I completed two degrees at the University of British Columbia. My first degree focused on chemistry, which is my passion, and my second degree is in pharmacy. I have been working in the pharmaceutical industry for the past 8 years. 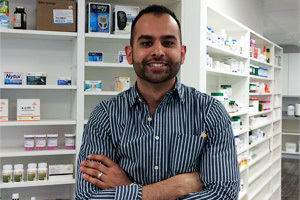 I developed my skills in compounding over the past three years working at an independent pharmacy in Langley. Learning how to compound medications fit into my passion for chemistry perfectly as I am able to include my chemistry background into creating new and custom formulations for my patients. I am also able to vaccinate patients as well as fit patients for compression stockings. So come on down, pay me a visit and pick my brain as I would be happy to discuss all topics, medical and non-medical, with my patients.